Welcome to our Oslo Guide! Our Oslo Guide aims to be your number one source on the internet for information on the capital of Norway. Lots of tourists come to our beautiful city all year around to see the beautiful landscape, the special buildings, the new Opera house, to travel on a fjord cruise and to see what life is like in the Norwegian capital. 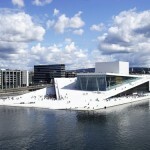 In our travel guide you will find information about the most important sights and attractions in Oslo. Read about the famous Vigelands park, find information on the Holmenkollen Ski jumping facitilities and read about other important sights as well. We also describe cool activities and family programs available. If you are looking for a place to stay while in Oslo, then check out the description of some nice Oslo hotels and do not miss out on our practical advices on public transportation and other travel issues in Oslo. If your stomach tells you that you are hungry, then read about some restaurants and while preparing for the meal, enjoy the different pictures added to all articles published in our Oslo Guide. We hope you find what you are looking for and wish you a pleasant stay in our interesting city!